It's been over 2 years since I was last here and it's a shame that I haven't gotten back to Sunny Valley sooner. I had intended on riding Bennetts Pond over in Ridgefield but when I pulled into the lot there were so many hunters that I didn't fell like taking any chances, even wearing bright clothing (yellow) and bells. Instead, I headed over to Bridgewater to the Nature Conservancy propery known as Sunny Valley. As you can see by the profile above, Sunny Valley pretty much up and down. Starting out at Iron Ore Hill, the Blue Trail descends to the lake and then you climb back up again. I always like to tray something new so this time I took the red trail back down to the lake and then proceeded to climb back up. Some parts were hike-a-bike and everything else was pretty rideable if you like fall line climbs. 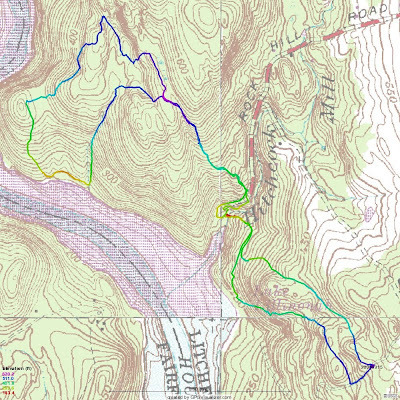 Trails at Sunny Valley are comprised of single track and old cart roads. The Blue Trail is the most technical trail the place has to offer but I think I have only ridden half the place. Below is my three rides in three years map. 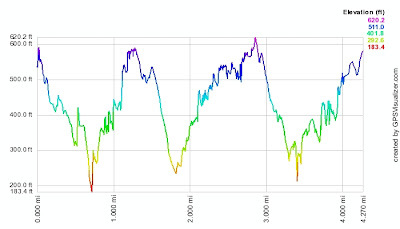 The red track is from 2005, the green track 2007 and the blue track was from today's ride. North of the red trail there are still miles of trails that I have yet to ride. 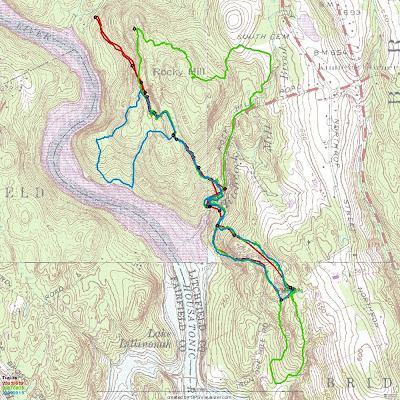 In fact, looking at the Nature Conservancy's website, they claim 13 miles of trails! I have only scratched the surface! Seeing how no hunting is allowed here I will definitely have to return and explore farther to the north.